A report warns that many countries have experienced a "severe and prolonged" outbreak last year. Data from the World Health Organization show an increase in cases in almost all regions of the world, with 30% more cases in 2017 compared to 2016. Experts say that complacency, the collapse of health systems and the proliferation of false information about the vaccine are causing the rise. They say that measles vaccines can save millions of lives. Measles is a highly contagious disease that, in severe cases, can lead to complications such as blindness, pneumonia, infection and swelling of the brain. The report, developed by the World Health Organization and the Centers for Disease Control and Prevention, examined measles cases over the past 17 years. 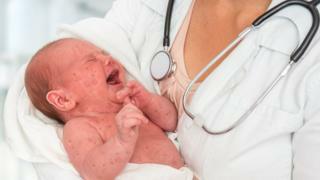 Experts say it is the first year that there is a steady increase in the number of cases, with 110,000 deaths related to measles. And they worry that the trends for 2018 are similar after cases peaked in Europe in the summer. The Americas, Europe and the Eastern Mediterranean region experienced the largest increase in cases. The Western Pacific region is the only region to have declined. A large number of infections have been observed in Venezuela, while health systems have collapsed after political and economic crises. The country had previously eliminated the disease. And there are fears that as more and more people move between countries in the region, the disease continues to spread. In Ukraine, Italy, France, Germany and Greece, the number of cases has increased in recent years. In the United Kingdom, which was declared free from the disease by WHO last year, small outbreaks also occurred in 2018. This led the English doctor to urge parents to vaccinate their children and ignore anti-vaccine myths. Dr. Martin Friede, WHO, told the BBC that it was disturbing to note that in a number of European countries, parents do not vaccinate their children. "Probably only in Europe, more than in other regions, reluctance to vaccination becomes a bigger problem than elsewhere." "In some groups, this is motivated by religious beliefs, but in many populations, it is transmitted by false concerns about the safety of vaccines." Dr. Friede said that social media plays a role in this area and that new ways must be found to combat misinformation. He said: "The industrialized countries must not be complacent and do not forget that the disease can come back like a storm. "It does not take a lot of unvaccinated children and when that happens, measles is not just a rash – it can cause blindness and brain problems." The report estimates that since 2000, the two doses of measles vaccine given to young children have saved more than 21 million lives. But Dr Soumya Swaminathan, WHO, said: "Without urgent efforts to increase immunization coverage and identify populations with unacceptable levels of under-immunized or unvaccinated children, we risk losing decades of progress in protecting children and communities from this devastating but totally preventable disease. " Is the mental health of young people deteriorating?